Tests across Africa reveal Aflasafe reduces aflatoxin by between 80 and 100%. Aflasafe is now available in Burkina Faso. Pictured here at the Aflasafe BF01 launch in Ouagadougou, Burkina Faso are (left to right): Mr Moussa Sylla, Marketing Director, Eléphant Vert, Mali subsidiary; Mr Abdou Konlambigue, Managing Director, Aflasafe Technology Transfer and Commercialisation initiative, IITA; Mr Ali Romba, representing the Minister of Agriculture and Water Management of Burkina Faso, Mr Jacob Ouedraogo; Mr Jean de Dieu Nikiema, representing the Interim Director of the Direction Générale des Productions Végétales, Mr Adama Savadogo; and Dr Hamidou Traore, Director General, Institut de l’Environnement et de Recherches Agricoles. 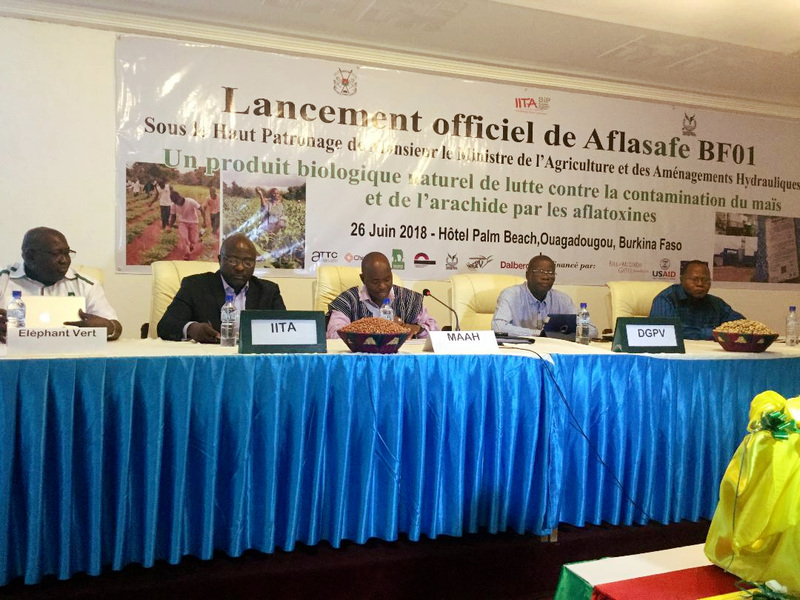 OUAGADOUGOU, BURKINA FASO, 26th June 2018 – Today, Aflasafe BF01 was officially launched in Burkina Faso to fight aflatoxin in the country’s food. Aflatoxin is a real and present danger – but tests have shown that Aflasafe BF01, the product specially tailored for Burkina Faso, reduces aflatoxin in maize and groundnuts by about 96% at harvest time. These two crops, which are staples on Burkinabe tables, are particularly vulnerable to aflatoxin. Groundnuts and maize also underpin the agricultural economy. Tasteless, odourless and undetectable by the naked eye, aflatoxin is a hidden killer, causing liver cancer, weakening of the immune system, and stunted growth in children. By lowering the amount of the toxin in food to within safe levels, Aflasafe can alleviate grave and widespread health consequences as well as opening up new markets and income opportunities. Though it is applied in the field while crops are still growing, safeguarding them from the beginning, Aflasafe’s protection also continues long after harvest, with studies revealing an aflatoxin reduction of 94% even after storage in poor humid conditions. 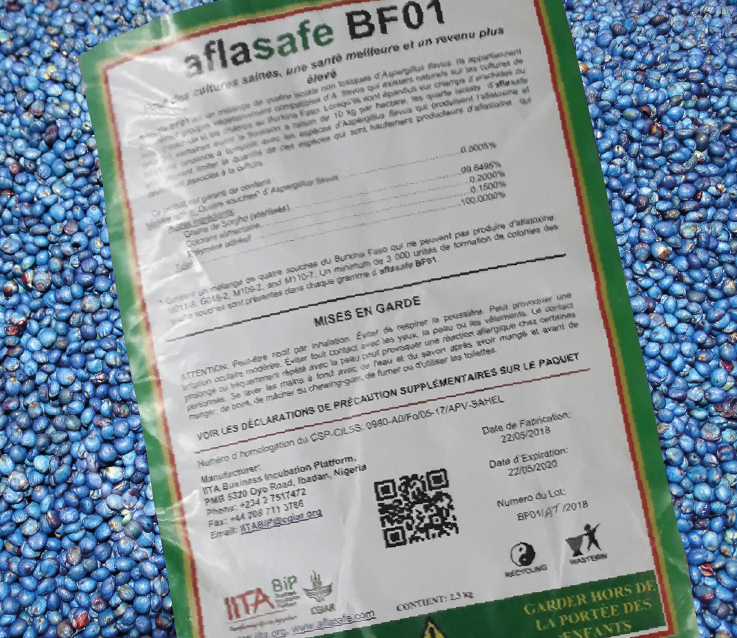 Aflasafe BF01 was developed by the International Institute of Tropical Agriculture (IITA), the Agricultural Research Service of the United States Department of Agriculture (USDA–ARS), and Burkina Faso’s Institut de l’Environnement et de Recherches Agricoles (INERA). 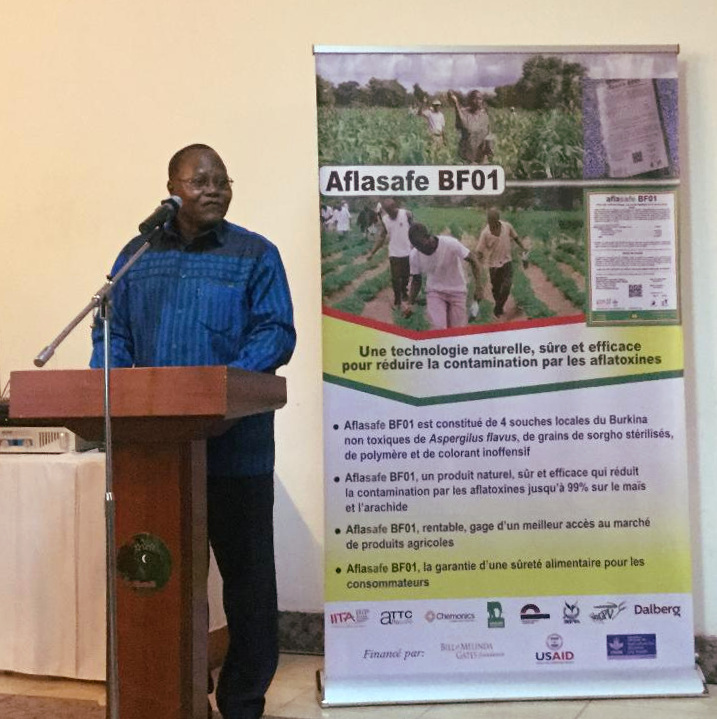 “Today marks a very important step in combating aflatoxin in Burkina Faso,” said Dr Hamidou Traore, Director General, Institut de l’Environnement et de Recherches Agricoles, at the launch of Aflasafe BF01. “Today marks a very important step in combating aflatoxin in Burkina Faso,” said Dr Hamidou Traore, Director General, INERA. “In 2010, INERA initiated a multi-institutional project to fight aflatoxin in maize and groundnuts, working in collaboration with the Ministry of Agriculture and Water Management, and with farmer federations and agro-food processors actively involved.” The product was successfully tested in the field in 2012–2013, followed by demonstration tests in 2016, leading to registration in 2017. Besides maize and groundnuts, aflatoxin is also found in various other foods from milk to chilli peppers. Aflatoxin even gets into baby food: a 2016 study examined cereal-based infant formula produced in Burkina Faso, and found that 84% contained aflatoxin B1 (the most toxic type). The worst-contaminated contained 900 times more than the safety limit – which is set very low for these foods, since babies are so vulnerable to the toxin. In another study, scientists found that half of ordinary maize intended for human consumption purchased across Burkina Faso was contaminated with aflatoxin B1, all at unsafe concentrations. The picture in groundnuts was a little better – with about a quarter of samples containing aflatoxin, many within safe limits – but still a cause for concern. Scientists also tested animal feed. They found that all the samples were highly contaminated. This means that the toxin gets into animal products such as milk, as well as making poultry and livestock ill and less productive. One of the big problems with aflatoxin is that it accumulates in our bodies throughout our lives, making any frequent consumption into a cumulative and ever-increasing health threat, even if it never causes any immediate or obvious symptoms. Look out for this label! All-natural Aflasafe is mostly sorghum by weight (over 99%), coated in friendly Burkinabe fungi that crowd out the aflatoxin producers. The sorghum keeps them going while they are getting established, and maize starch keeps them glued to the grain. Finally, blue dye distinguishes it from the sorghum we eat, and gives Aflasafe its distinctive bright colour. Aflasafe BF01 is now available for sale in Burkina Faso from Eléphant Vert. Before public release, several years of steadfast research and development were devoted to Aflasafe BF01. Five-year tests across several regions (Hauts-bassins, Cascades, Centre-Ouest and Est) showed aflatoxin reductions of between 80 and 99%. Given this good product performance, in 2017, Aflasafe BF01 was successfully submitted for registration by Le Comité Sahélien des Pesticides (CSP) of the Comité permanent Inter-Etats de Lutte contre la Sécheresse dans le Sahel (CILLS). 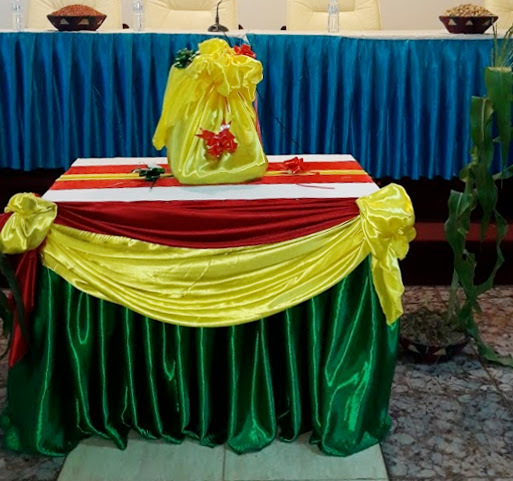 Veiled in Burkinabe colours – but ready to be revealed to the world! Aflasafe BF01 under wraps at the product launch. As part and parcel of commercialising Aflasafe in Burkina Faso, local production is anticipated, and product distribution networks will be strengthened. Aflatoxin is not unique to Burkina Faso, nor to Africa. According to the UN Food and Agriculture Organisation, 25% of the world’s food crops are prone to aflatoxin contamination, posing a threat to food security and public health. Africa does however bear the brunt, with the highest incidence of cancers linked to aflatoxin contamination (at least 30% of all liver cancer cases). More than 40% of food products sold in Africa’s markets have aflatoxin levels above the safe limit, while Africa loses CFA 360 billion every year in lost export opportunities. Produce that fails to meet the international bar is sold in domestic markets, posing a serious risk to public health. For example, in Burkina Faso in 2012, the World Food Programme rejected close to 2,000 tonnes of maize exceeding safety levels for aflatoxin. In addition, food processors targeting aflatoxin-conscious industries in Burkina Faso and West Africa such as breweries have been unable to sell their products to these lucrative markets due to aflatoxin beyond the levels these clients stipulate. About INERA: L’Institut de l’Environnement et de Recherches Agricoles (INERA) is one of the four national research institutes under the auspice of the National Centre of Scientific and Technologic Research (CNRST) in Burkina Faso. Its mission is to improve the livelihoods of smallholder farmers by implementing policies and conducting research on agricultural and environmental development. INERA contributes to disseminating scientific and economic results; decentralising and regionalising environmental and agricultural research to promote optimal development based on regional potential; enabling technical support to agricultural development; capacity building; promoting research–development links and technology transfer; and producing foundation seeds for different agro-ecological zones. INERA collaborates closely with private companies and farmer organisations to cover the value chain from production to sale. About Eléphant Vert: Elephant Vert is a Swiss business group created by Antenna Technology, a foundation specialising in the research, adaptation and transfer of innovative technologies to fight poverty and promote sustainable development. Our job is to invent new agricultural solutions for farmers, which make it possible to extend successful, healthy and sustainable agriculture. These solutions are: (1) products that complement and/or replace, partially or totally, conventional inputs [pesticides and synthetic chemical fertilisers]; and, (2) technical and financial services that help farmers access these products. Eléphant Vert masters innovative biotechnology, using micro-organisms of interest in agriculture. Eléphant Vert does not use genetically modified organisms (GMOs).